Hi friends, I'm so glad you are here! This is my first time as a guest participant in the One Room Challenge and I couldn't be more honored to take part in this event. In case you're not familiar with The One Room Challenge, it is a bi-annual event put together by Linda at Calling It Home. Over the course of six weeks, bloggers are challenged to renovate, remodel or makeover a room while documenting their progress along the way. If you are new to my blog, welcome, I'm so glad you stopped by to visit. My name is Julie Nichols and I share decorating ideas, DIY tutorials, simple styling tips, easy to do repurpose projects and so much more. I love inspiring others to create a home they love without spending a lot of money. For this challenge, I will be working on a complete guest bedroom makeover top to bottom! Let's take a look at my design plan and talk about what I would like to do to this space. My husband and I purchased a fixer-upper 16 years ago and this is the last of the five bedrooms to be renovated. The house was nasty from the outside to the inside when we moved in. This room pretty much sums up what the entire house looked like when we purchased it, so you can imagine how thrilled I am to finally makeover this room. 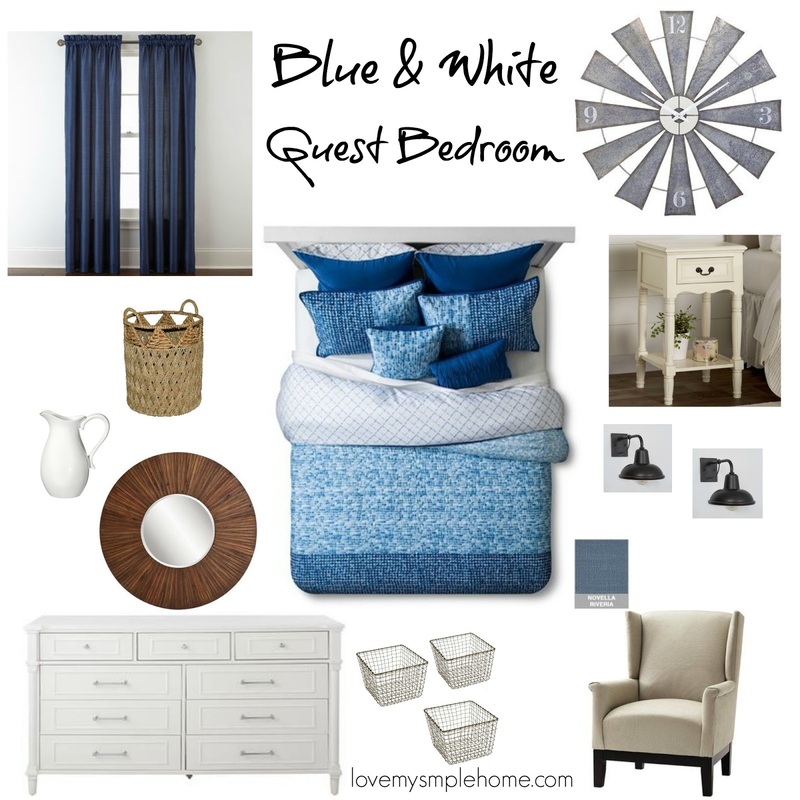 My plan is to make this bedroom a pretty retreat for guests using a blue and white color palette. My design style is classic with a mix of rustic, farmhouse, coastal and a little modern. These design styles are my inspiration for this room and will be reflected in the completed project. This is the bedroom I will be working on along with my husband. We use it for storage and is in poor condition. I removed most of the things from this depressing space then took some photographs. I can not wait to get started with this complete guest bedroom makeover. For the next five weeks, I'll be posting updates each Thursday. In week six, I'll reveal the completed space. I would love for you to follow along, as well as visiting some of the other participants in this challenge. Click on the link below to visit the other participants. How exciting! Can't wait to see the reveal. That room has a lot of potential and I can't wait to see how it turns out! Looking forward to following your progress over the next six weeks. Good luck! I love your design choices and can't wait to see how your space comes together, because there is so much potential in this bright space. I'm excited to see what the room will look like for the reveal! I'm doing our guest bedroom for the ORC, also.